WhatsApp Business is a free to download dedicated application, focused mainly for small medium enterprises and multinational corporations. Its primary goal is to enable businesses to interact with their customers. In the era of the digital era, connecting with your customers was never more important. This business-oriented app helps 1.8 billion users to chat with businesses that are important to them. The main difference between original WhatsApp and this one is the bundle of business-oriented features offered. Of course, you can use it also like an everyday messenger, share photos and much more. Some research shows that users of WhatsApp and similar services are willing to engage with businesses on a daily basis. According to Nielsen’s Facebook Messaging Survey, 67% of mobile messaging app users said they expect to use chat more for communicating with businesses over the next two years. Moreover, 53% of respondents said they’re more likely to shop with a business they can message directly. 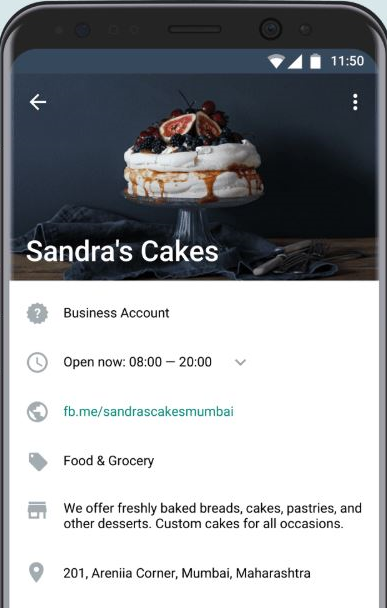 1. Business profile – gives you the ability to create a profile with helpful information for your customers like your location, description, email, and website. 2. 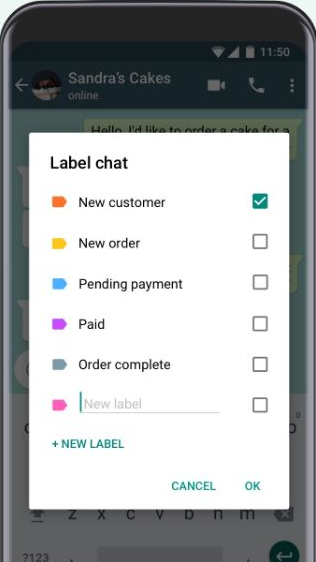 Labels – they help you to organize your contacts or chats, so you can find them easily later. You can make labels for new customers, make ones for specific types of customers. For example, you can make the ones that paid in full or those who still have a payment pending. This is a great way to stay organized all the time. 3. Quick replies – this lets you save messages that you frequently send to others, so you can resend them again without wasting time to type it repeatedly. Another way to use this feature is to maximize response potential to customers that have common or FAQ questions. This way, you can make sure you provide the highest level of customer care in the shortest time possible! 4. Automated messages – a great way to engage your customers, or simply inform them when you’re away. It’s also useful for letting customers know when they can expect a response to their question or inquiry. 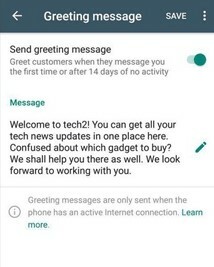 You can also create some greeting messages whenever a new customer is introduced to your business. 5. Messaging statistics – this feature will benefit your business the most when it comes to improving your overall customer care. 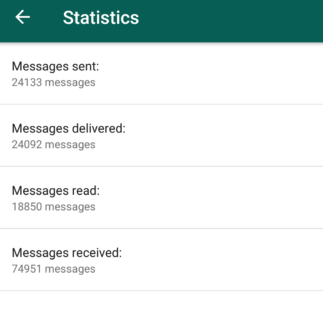 WhatsApp offers to you metrics about the number of successfully sent, delivered and read messages. It allows for a specific and precise insight that is invaluable to your brand. As we already mentioned, the app is free to download, but there are some things you should pay attention to when it comes to setting up your business account. Related: Is E-commerce Overtaking Traditional Retail? Using WhatsApp for internal communication is a great way to connect your employees into organizational groups, like marketing or human resources. This will allow them to share messages, files, photos with each other. It’s far better and faster for internal communication since it offers you both desktop and mobile version free to use. WhatsApp can be a great tool for supporting your customers when they have some trouble or questions. It’s great 1-on-1 support. However, if you have a big number of customer requests throughout a day, you may want to look at other options. You could always look up a helpdesk software solution, something like Paldesk. Whatsapp Business can be a strong marketing tool because it offers a way to directly communicate with potential clients. You can send promotional images, short commercial videos of your products. Just be sure you don’t spam your customers because nobody likes to receive tons of spam messages in their inbox. Try to focus more on existing clients, rather than trying to reach out to new customers. There are plenty of innovative usages of Whatsapp for business purposes. For example, lots of restaurants offer the possibility to order food by using the app. In India, they even started to launch government services like helpline for their citizens. Medical doctors have been known to offer medical consultations on WhatsApp. See the example included below. 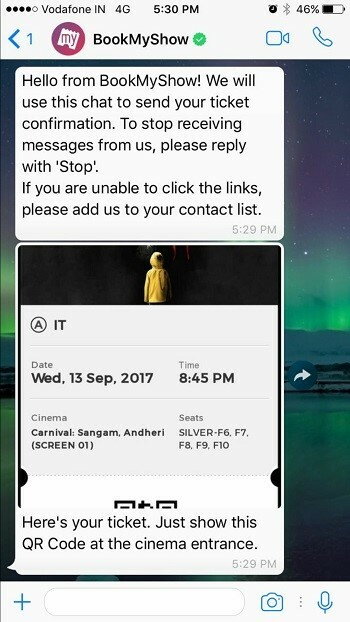 BookMyShow implemented WhatsApp into their business, and they use it as a ticket confirmation for movies in cinemas. More and more mobile users will use messaging applications in the future, as a primary way of communication. This including both formal and informal communication, so it’s important to get ahead of the curve. 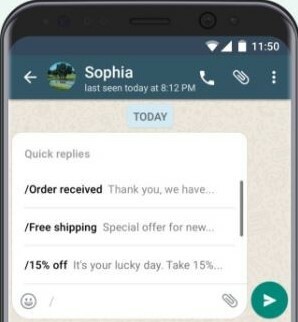 It’s fair to assume that WhatsApp will probably launch a lot more new features for business profiles in the future, that will help your company provide better customer experience and make users relate to your business more. Stand out from others and give all your communication a more personal touch, humanize your brand. The whole business world has gone digital, so there’s no time to waste. 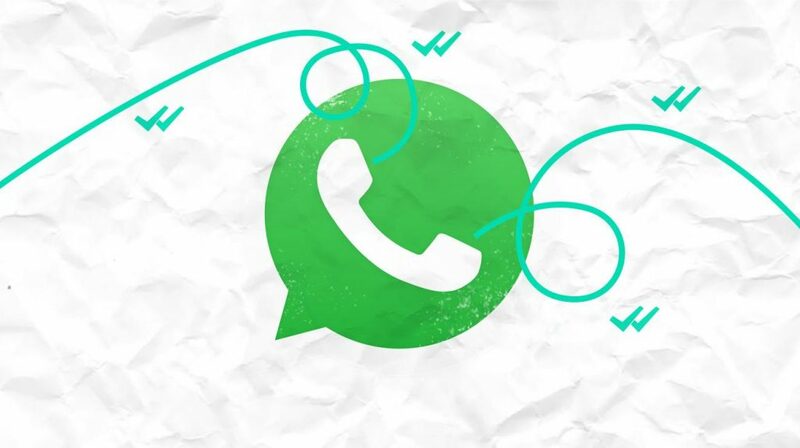 It’s never been more important to find new ways to communicate, which Whatsapp provides.